Please note We Jordan Tours own 35 Arabian horses. 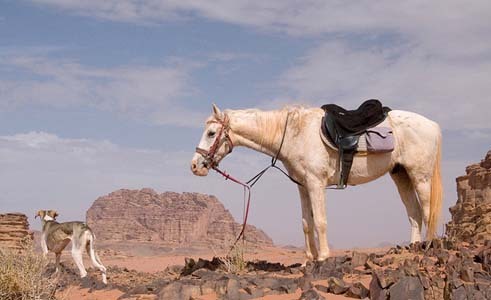 Our main Stables are located in Wadi Rum and Petra. Our horses well trained for the desert trails ! All horses are female Arabian . Well trained and familiar with the desert. All horses are recently shod, with no risen clenches or loose shoes . The Overall Conditions and appearance of the horses will reflect the care of Jordan Tours as we are the Owners through the assistance of the Brooke hospital for animal and every endeavor will be made by the riders on the ride to ensure that the horses return in equally good condition. Traditional , English or Pakistani style . Mainly clients prefer traditional Style. Well fitting and have sufficient padding underneath to prevent pinching or saddles sores . All saddles have girths ( of correct length and good condition in order to avoid girth galls or breakage . Traditional style saddles have thick blanket on top to aid rider comfort. Stirrup leathers always in good conditions, with safe stitching to ovoid breakage. English type snaffles, or correct size for each horse and with rough edges. Leather Bridles or traditional style materials properly fitted . 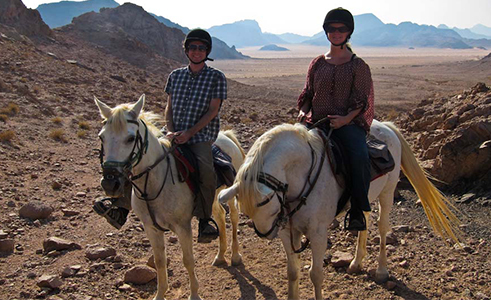 Experience the hidden wonders of Jordan with Jordan Tours Horse Riding Tours. Have you ever dreamed of galloping through the unspoiled valleys of the Biblical land of Jordan? Of experiencing the mystical, dream-like landscape of Lawrence’s Arabia from the back of an Arab steed? Of riding through the canyons and gorges travelled by the Bedouin over the centuries and sleeping under the star-filled desert sky? By creating the only Jordanian, Bedouin horse-riding company, Jordan Tours, aims to fulfil your dreams – and more – letting you experience the wonderful land of Jordan in a truly authentic and magical manner. Our company combines both experience and professionalism in all kinds of adventure tours, with a deep love of horses and the natural environment of our beautiful Country. Under the direction of our skilled and enthusiastic staff you will discover this country yourselves, following the best itineraries in complete safety whilst making real contacts with the local people – off the beaten track and away from any touristic artifice. To gain maximum enjoyment from our tours, it is essential that you be in good physical condition. You will be riding for 5 to 6 hours per day, often over long distances. Our tours are recommended for experienced riders, comfortable at all gaits, used to the outdoors and not frightened by the limitless environment of the deserts and canyons. This is dynamic riding, riding with feeling, needing confidence and spirit. Horses have long played an essential and honourable role in the life and times of our society and continue to do so to this day. Our horses are bred by Bedouin to withstand the harsh conditions of Bedouin life and educated according to Bedu criteria, culture and customs. Their family lineage assures them the essential capabilities for desert life, not least of which is to be fast – very fast ? 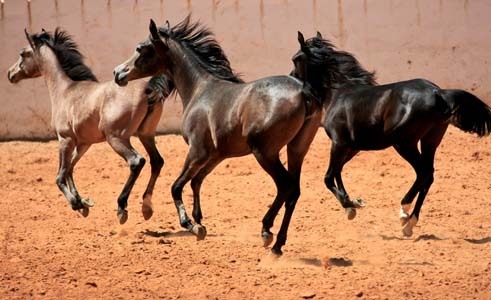 With us, you will be riding real Arab horses, almost all mares, of diverse origins – Jordanian, Syrian and Iraqi. All of our horses are generous and animated, all pleasant to ride despite (or perhaps indeed because of!) their strong constitution. The stamina and gaiety of Arab horses are well renowned – they love to race. Please note, these are not school horses, but working horses schooled by Arabs – light hand and leg sensitive. Our horses are constantly trained, taking part in races and perfectly epitomising the mentality of the desert horse – a desert mentality we hope to share with you. If desired, Bedouin horse customs can be re-enacted for your group – ambush techniques, real war time events to transport you back to a time when the freedom of the desert was limitless. Whilst we provide the highest quality tack for our horses, you may also bring your own saddle with you – just let us know what you wish! Originally Bedouin horses were ridden without a bridle-bit for regular activity – the bit was only for races and battles, or for particularly spirited animals. Nevertheless, for convenience and to suit our customs we use “olive” bits, Pelhams or Hackamores with small branches. Our horses are shod with full metal shoes for the rough terrain. Professional guides will be provided according to Nationality and group size. All of our guides are licensed and well-experienced and as well as providing information about the country and its peoples, will be responsible for good relations with the locals and can take charge in case of any emergency.